OKLAHOMA CITY–(BUSINESS WIRE)–SONIC® Drive-In (NASDAQ: SONC), the nation’s largest chain of drive-in restaurants, presented ten awards to franchisees and operators at the 2018 SONIC National Convention in Washington, D.C. earlier this week. Each year, SONIC honors individuals and franchise groups in recognition of their strong leadership skills, exemplary brand representation, and record of brand growth. 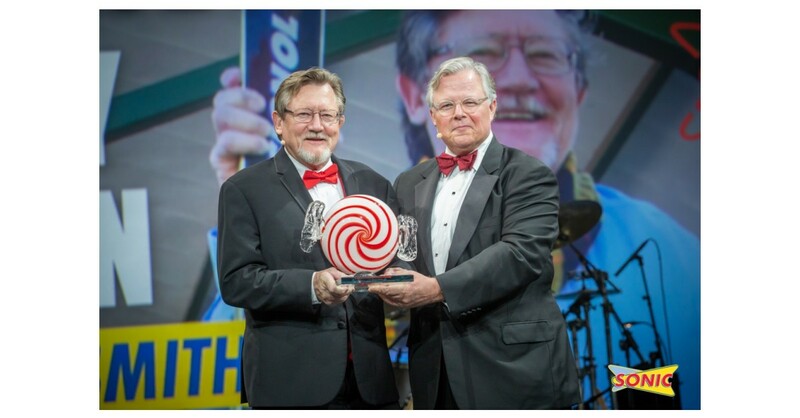 Induction into the Troy Smith Hall of Fame, named after SONIC’s founder, is the most prestigious award SONIC grants to a franchisee each year. The honor is given to a franchisee who has worked with SONIC for a significant time and has made a substantial contribution to the brand through leadership, brand growth and positive impact. This year, SONIC presented the Troy Smith Hall of Fame Award to Rodney Warren, leader of The Warren Group in Lubbock, Texas. Warren owns and operates 40 SONIC Drive-Ins in Oklahoma, Texas and New Mexico. He began his career with SONIC in 1974, alongside his sister and brother in-law in Alva, Okla. as a manager trainee, later working with his brother and now, two sons. Since then, he has worked at, operated and developed numerous drive-ins, demonstrating his longstanding commitment to grow the SONIC brand, helping team members achieve success and providing guests with an outstanding experience. SONIC presented the Chain Leader Award to Mike Parker, senior director of operations and human resources for Pete Esch Group, in recognition of his leadership skills and positive influence on the SONIC brand. Based in Bentonville, Ark., Parker began his career at SONIC as a cook in high school. He has grown to be a strong leader associated with 67 drive-ins located in eight states, including Alabama, Arkansas, Georgia, Illinois, Kansas, Missouri, Nebraska and Tennessee. Parker also currently serves on the HMS Advisory Council and as a FAC regional member. Ryan Angel, supervising partner and director of profitability and new store development for the D&B Legacy Group of Illinois, was presented with the SONIC Turnaround Operator Award. This award is given to an individual or group responsible for turning around operations, sales and profit performance at one or more SONIC Drive-Ins. Based in Dyersburg, Tenn., Angel is the supervising partner of eight drive-ins located in Illinois and is a partner of three locations in Tennessee. He has led achievements in improving sales and profits, while focusing on delivering a positive guest experience. The Great People Award was presented to Greg Rowden, franchisee of DHR Group in Searcy, Ark. SONIC awards this recognition to an individual or group who has effectively prioritized the recruitment, training, development and retention of people as a strategy for growth. Beginning his career with SONIC more than 30 years ago as a Carhop and cook, Rowden has grown to be a leader dedicated to the growth and success of his team members. SONIC presented Operational Excellence Awards to Corina Gonzales, based in Pecos, Texas and Kooroush Asrarynezami based in Globe, Ariz. This award is given to individuals responsible for supervision of less than five drive-ins who have displayed dedication to developing talent and growing sales and profits. Gonzales began her career with SONIC more than 20 years ago as a Carhop in San Angelo, Texas and is now general manager of a drive-in located in Pecos, Texas. Gonzales strives to build and maintain a strong team, displaying a strong work ethic for delivering positive guest experiences and increasing her drive-in’s sales records. Asrarynezami has worked ten years at his current drive-in, beginning with his first SONIC position as a Carhop. He has shown exemplary leadership skills to motivate and develop his team and has won multiple awards in his career as assistant manager and manager. The Multi-Unit Leader Award was presented to Gary Stanley, supervisor at Hart System Inc./Jack Hartnett, and Sander Wood, director for Galadco, Inc. This honor is awarded to individuals who supervise more than five drive-ins and have a proven track record of upgrading talent, fostering positive financial performance at their drive-ins and delivering exemplary guest service. Stanley, based in Mansfield, Texas, started his career with SONIC as a cook, and now supervises nine drive-ins across the Dallas and Waco, Texas areas. In his more than 30 years with SONIC, Stanley has won several awards for sales and profits accomplishments and exhibits his commitment to the brand and customer service as a member of the FAC Customer Engagement Committee. Sander Wood of Conway, Ark. started his career with SONIC as a training manager in 2007. Wood now acts as vice president of operations for six drive-ins in Arkansas and has exhibited a strong commitment to talent development, financial growth and outstanding customer service. SONIC presented the Newcomer Award to Kamal Singh, president and CEO of Emerge! Inc. This award is given to an individual or franchise group new to the SONIC brand who achieves strong sales and profits in addition to delivering the SONIC promise to guests every day. Led by Singh, Emerge! acquired and now operates 34 Sonic Drive-Ins in Houston. The Mason Development Award was presented to Cody Barnett, president and CEO of The Barnett Sonic Group. Based in Oklahoma City, Barnett is a second-generation SONIC franchisee who began his career as a Carhop. He owns and operates 45 drive-ins in Houston, San Antonio and Waco, Texas, helping lead growth and development of the SONIC brand.